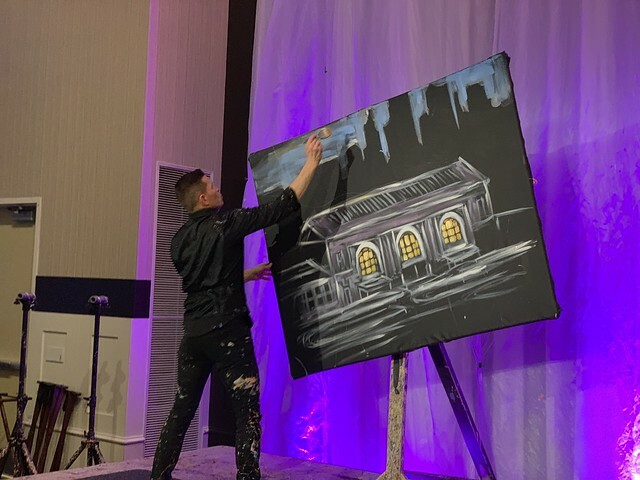 Thank you to all who Painted the Town at our 2018 Annual Dinner! It was an amazing event due to our attendees, sponsors and planning committee. The program was emceed by Abby Eden of FOX4 and featured remarks by 2017 Citizen of the Year and Presenting Sponsor Kevin Tubbesing, President & CEO Ann Smith-Tate, 2018 Chair of the Board Dennis Monahan of Central Bank of the Midwest and 2019 Chair of the Board Heidi Thummel of GBA. As is tradition, the Citizen of the Year Award winner was announced and none other than Vicki Charlesworth, former Deputy and Interim City Manager, was awarded this honor. Thank you to Vicki for your commitment to Shawnee for the last 30 years. Thank you again to our sponsors for supporting the Chamber and this event. It was a special night and wouldn’t have been possible without you. We must also thank those who participated in the live and silent auction. Those funds support a variety of programming and scholarships through the Chamber of Commerce Foundation.